Old traditions die hard, or so they say. But they are dying right now, as the Right-Left choice no longer satisfies an increasingly disillusioned public now turning to the so-called fringe parties, some with regional or special interest ideas, some genuinely reformist, others simply cranky reflecting their supporters view of a cranky and dysfunctional world. The relationship between work and reward is one of the most significant, enduring and contentious issues confronting politics today. It is also the most ignored. And in the absence of any orderly formula for resolution we resort to simple disputation which sets in motion a train of economically and socially destructive consequences. Establishing wages and prices by dispute produces inflation – money which is useless as a store of value – and the Economic Cycle of boom-and-bust which in turn requires a degree of permanent structural unemployment and inhibits longterm investment and growth. Is our money really so baseless, so meaningless that we can simply and with impunity demand more money for the same work or the same product or the same service? Yes it is. Neither remunerations nor prices bear any relationship to the work involved in the product or service being offered for sale. The wage for a job, the price for a product, is quite simply: as much as you can get. In a slack economy we mitigate our demands. As the economy expands, we all push for more. And the result is inflation. Even as we bank wages and salaries, or take cash earnings out to spend, in terms of purchasing power our moneys real value is slipping through our fingers. Inflation is not the complex esoteric phenomenon economists would have us believe. Inflation is simply a matter of human greed – our natural desire to get more reward for the same amount of work – combined with a monetary unit which lacks any meaningful definition or inherent value. How does a nation survive socially and economically using a currency with no defined value, constantly drifting upwards? The answer is that it doesnt. None of them do. Money, which should act as a store of value, is universally scorned as a savings medium, leading to speculation, largely in housing. And the longterm effects on the economy and on growth (or any hopes of it) are far-reaching and seriously damaging. Economic growth can never be maximized – the ideal of everybody working, everybody working productively. For growth leads to wage and price increases – inflation – which central banks attempt to check with higher lending rates, thus leading inevitably to recession. The disastrous economic effects on growth and productivity are bad enough. There are also serious social consequences which are now becoming a major political issue. The free market ideal is that it brings wealth to the whole of society, not just a few at the top. Historically this ideal has never been realized; whats new today is the absence of subservience which previously allowed society to get away with it, plus the huge and ever-increasing gap between the ultra-top, and the rest of society which not only feels its getting relatively poorer – it actually is. And while the older generations are still enjoying a legacy, now fading, of a reliable pension and a house bought for a then-reasonable price and now worth a fortune, younger generations are facing an increasingly uncertain future, unable to afford a home with the security of family life that goes with it, relying by default on living at home with parents or in rented single accommodation. Gross inequalities of wealth, industrial disputes, inflation with its correcting recession, loss of productivity, permanent structural under-employment, and a total block on prosperity maximization... hardly an impressive record of political-economic management. And the culprit, the cause of this dysfunction and the distress which it causes, lies in the fact that pay, prices and profits are determined by unregulated disputation – in other words: anarchy. And yet alternatives, peaceful resolutions are there, well developed, and already in widespread use. 2) A limit on profits, requiring excess to be returned to the customers as lower prices. Job evaluation is now well tried and widely practiced, linking pay with the requirements of the job. Applied nationally and in standard format, Job Evaluation can ensure both perceived social justice, and remuneration stability. With limitations set on retained profits, a clear relationship between production cost and selling price is established, thus ensuring price stability. Increases in productivity, less work for the same or greater output, are reflected directly in lower prices, resulting in increased purchasing power and standard of living for all. If it costs less to produce, it should cost less to buy. 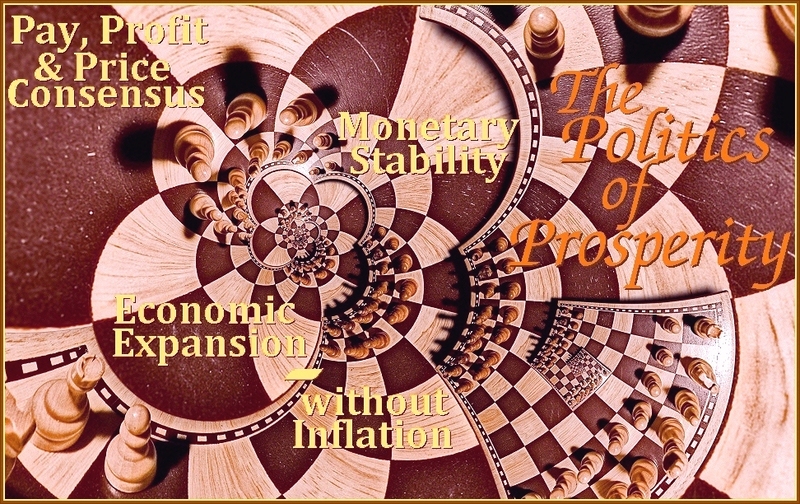 The combination of Remuneration and Price Stabilization can bring a multitude of benefits: widely acceptable social justice, a fair days pay, rising productivity, full employment, and a stable monetary unit which increases in real purchasing power as productivity-increases feed through into lower prices. The idea of living in a society where the cost of living goes down slowly, year by year instead of up, where your savings are not only safe but increase in value, where your domestically produced goods get progressively better and cheaper, where a fair days pay for a fair days work in decent conditions is an accepted norm rather than an on-going battle – it may seem utopian. In the politically developed nations today there is a growing desire for a new politics of universality and collaboration, administered by a lean, efficient and disciplined government. "A wise and frugal Government, which shall restrain men from injuring one another yet leave them otherwise free to regulate their own pursuits of industry and improvement, and which shall not take from the mouth of labor the bread it has earned: this is the sum of good Government necessary to complete the circle of our felicities". "What matters is that each man should be free to develop his own personality to the full; the only restrictions upon this freedom should be those which are necessary to enable everyone else to do the same." That we should all be free to pursue our individual lives and happiness in whatever way we choose as long as we do not injure or dispossess others: this is the Eternal Law of social conduct, the fundamental Principle of Liberty instinctively familiar to us all. The Principle of Liberty requires in our personal relationships, in business and commerce and in our use of natural resources, that we respect others as we would have them respect ourselves. It is a Principle as old as human conscience: it will be recognized by anyone familiar with the Sermon on the Mount. The consistent application of this Principle in everyday law would maximize liberty in the nation under its care. With the guidance of this Principle we would share resources equitably and use them wisely, we would trade fairly, we would respect the property, privacy and peace of one another. We would learn to live in liberty, respecting and not infringing the liberties of others. And we would prosper: for collaboration is an infinitely more creative, more powerful, more productive force than confrontation.